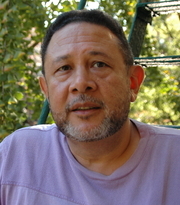 Jaime Manrique is the author of many novels, essays, and poems, including Latin Moon in Manhattan. He is currently a Distinguished Lecturer in the Department of Foreign Languages at the City College of New York. His latest novel, Cervantes Street, was published last month by Akashic Books. For those who might not have had a chance to read your book, tell us a bit about Cervantes Street, if you would. It's a biographical novel about Miguel de Cervantes Saavedra, author of Don Quixote. The novel is also about the rivalry between Cervantes and Alfonso Fernández de Avellaneda, who appropriated Cervantes' characters and published his own Don Quixote. Cervantes published Don Quixote in two parts. Between the first part and the second one ten years went by. Before Cervantes could publish the continuation of his story, Avellaneda published his own Don Quixote—a kind of sequel. You must have done a significant amount of research into the life of Cervantes; what sources did you find particularly useful? Before I wrote a word of the novel, I returned to Madrid, a place where I had lived in my 20s. One day a friend gave me a tour of La Mancha. And when I saw the old windmills, las Lagunas de Ruidera, and visited the Cave of Montesinos, in particular, I felt I had entered Cervantes' world and I knew I could write about the places I had seen. After that I made trips to Seville, Córdoba, Esquivias (where he married—this place was crucial for my understanding of where Don Quixote really came from), Algiers, the towns of Oran and Mostaganem in Algeria, Rome, and finally a journey to the see the Bay of Corinth where the great Battle of Lepanto was fought. Of course, I read Cervantes' other works, many biographies, and scores of books about the Spanish Golden Age and the Renaissance. You've imagined the identity of Avellaneda, the author of the spurious "second part" of Don Quixote published in 1614. How did this work shape the contemporary reaction to Don Quixote? When Alonso Fernández de Avellaneda (a pseudonym—nothing is known about the person behind the nom de plume) published his sequel to Don Quixote Part I, it was generally well received and it achieved a certain popular success. Of course, after Cervantes published his own Don Quixote Part II, Avellaneda's novel was ridiculed and eventually forgotten (though the book is still in print and there are people who have read it—including myself). Unlike Shakespeare who wrote many great plays, Cervantes wrote only one great novel. His other full-length novels are kind of unreadable; his verse is undistinguished. However, the plays that survive are interesting and have splendid moments and beautiful language, and the short ones are marvelous comic inventions. Among the Exemplary Novels are a couple of dazzling jewels. I'm very fond of the Colloquium of the Dogs—which though a bit long-winded is a marvelously unique and inspired short novel. Though many of the texts I consult in the writing of a historical novel are not literary texts, I'm a sucker for all the information you find in them (which to me is endlessly fascinating). My favorite part of writing is revising. That's when the fun begins. To shape an inartistic first draft into something nicely crafted is the greatest pleasure for me as a writer. The great European novels of the 19th century: Crime and Punishment, Anna Karenina, Fathers and Sons, The Charterhouse of Parma, The Red and the Black, Pére Goriot, Wuthering Heights, Jane Eyre, Silas Marner, Oliver Twist, and Pride and Prejudice. Some of these books I read many, many times (Wuthering Heights 18 times). And I never get tired of reading Hamlet, out loud. In Spanish, of course. What's your own library like? What sorts of books would we find on your shelves? How are they organized? I do have thousands of books, in English and Spanish. And some books in French. I also inherited hundreds of art books and poetry volumes from my late partner, Bill Sullivan. They are in storage. I hope some day soon to take them out and put them on shelves—but not in my apartment in the city, where there's no room for even one more paperback. Nowadays I give away all the books I know I'll never re-read. I just finished reading Junot Diaz's This is How You Lose Her. In August I got back from a trip to Bolivia and Colombia, so I've been reading many novels, short story collections, and volumes of poetry in Spanish. Just about all those writers are unknown here. But I can tell you there are many exciting new writers in South America right now. Sorry, but I don’t want to start talking about my new novel at this early stage. All I can say is that it is a tragic love story.